Good day, everyone! You may have noticed some changes in the layout of the blog in the past few months and some new additions for pages. I'd been meaning to do these things for awhile but never felt like I had the time. The Recipes page was probably the longest in coming. I felt like that was something I really should be sharing so I have added all of the recipes I had access to in a digital format. It still needs a bit of work since I feel each recipe should have a picture (I am unlikely to cook anything without a photo) so you can see all of its yummy goodness and I also think many of them are not in an accessible format--they're in a format that works for me. Adventure: tortellini with breadcrumb/proscuitto/basil mixture. I'm having a bit of a problem expanding the offerings though and here's why: I'm a rebel. Just kidding. But sort of. I tend to not like being told what to do, whether it is a wedding reception song like the Bunny Hop telling me how to dance or a recipe telling me how to cook. I prefer ideas of meals to actual recipes. I think that's why I find looking at Pinterest recipes inspiring--the image represents an idea of a meal I could make. Oh, I'll usually scan the ingredient list and instructions for general guidelines and cooking temperature and time. But there's no way I'm measuring spices. But stay tuned; things like 3-2-1 Chili, fajitas, chicken parmesan, and Sweet & Spicy Asian stir-fry are on their way and I welcome your suggestions on formatting what I already have available. I realize I really need to work on my food photography skills. 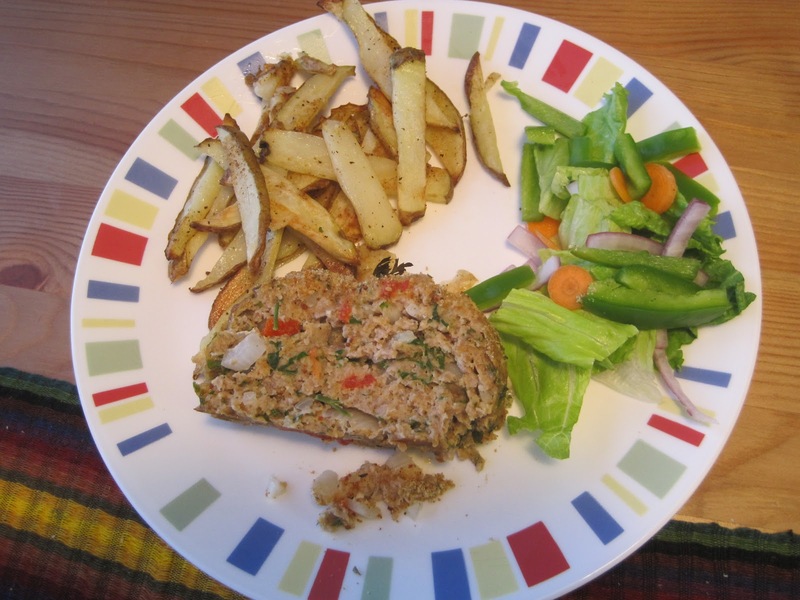 But I promise--this turkey meatloaf is GOOD! What about you--do you cook with recipes? Do you have a large repertoire, or do you stick to a lot of the same things? Hi! I found my way here via Home Sanctuary. (I have met Rachel Ridge in person and just adore her.) As for cooking, I am the same way--a recipe is more of an idea for a meal .Rarely do I have everything a recipe calls for, but if the key ingredients are around, I go for it. I also eyeball everything and substitute often. If I'm creating a dish for the first time and I think I might like to remember what I put in it if it turns out well, then I jot approximate measurements down. I hate to measure spices, which is probably the main reason I'm not an accomplished baker! I prefer art over science. I scrolled down and read some other posts and see we have another thing in common--a collection of napkin rings! Hey Zoanna! Good to hear from you. That's awesome to hear you have a napkin ring collection too! I haven't known anyone else who does that. How many do you have and where are they from? If I'm cooking something new, I follow the recipe to the letter. I'm not a great cook. But if its an old stand by or basic, I just cook it. But I'll admit that's rare--its stuff like spaghetti and pizza!